FINAL UPDATE: Sadly, Dash didn’t win the contest, but we all know he’s a winner anyway. UPDATE: Thanks to all his supporters, Dash has made the cut AGAIN! He is now one of the 50 finalists. Voting starts anew for these 50 and continues until July 5th. You may vote once per valid email address per day. IP addresses are stored to avoid fake email addresses and vote falsifying. Email or vote falsifying is grounds for immediate disqualification. Please call in all your friends and family who might be convinced to cast one vote a day for a Greyhound as Arizona’s Top Pet. If Dash takes first place, he will donate $500 to Greyhound adoption! Dash, a 10-year-old retired racing greyhound, is a competitor in the Mix 96.9 contest for Arizona’s Top Dog. He made it through the first round and is now one of the Top 200 – and the ONLY GREYHOUND left among the entrants! Dash has committed to donating 25% of his winnings to help promote greyhound adoption if he gets a cash prize (top prize is $2000), plus it would be great PR for the retired racing greyhound community to have one of their own win. Let’s get this sweet boy elected as the #1 dog in Arizona! Click the link below to vote – you can vote once per day per email address. 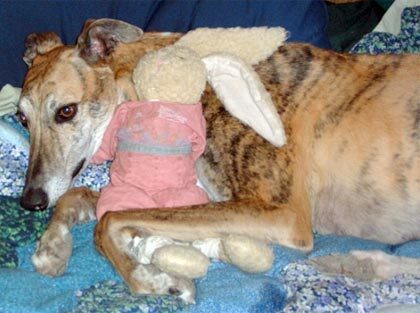 This entry was posted on 8 June 2010 at 4:50 pm and is filed under Arizona, Dog Rescue, Greyhound with tags Arizona, Greyhound, Top Dog. You can follow any responses to this entry through the RSS 2.0 feed. You can leave a response, or trackback from your own site.